How Can Play Engage the Senses? 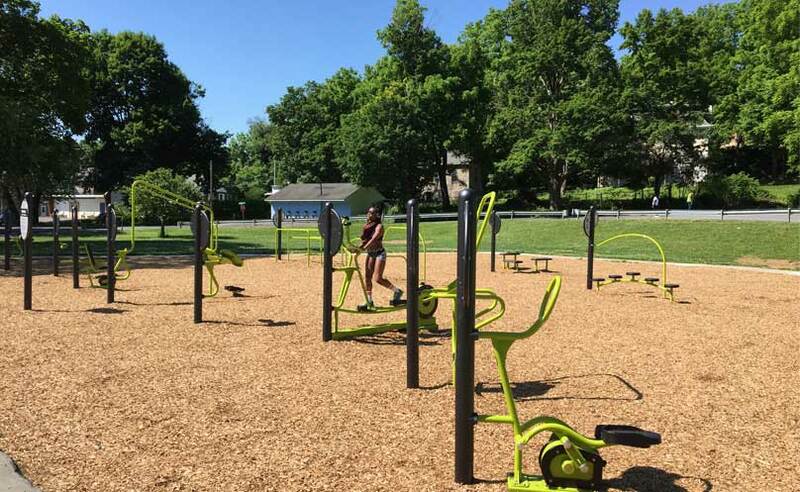 Residents of Allentown, PA, are pumped about the Department of Parks & Recreation’s new outdoor fitness system at Jordan Park. Imagine a full-body workout in a beautiful natural setting – without the membership fee. 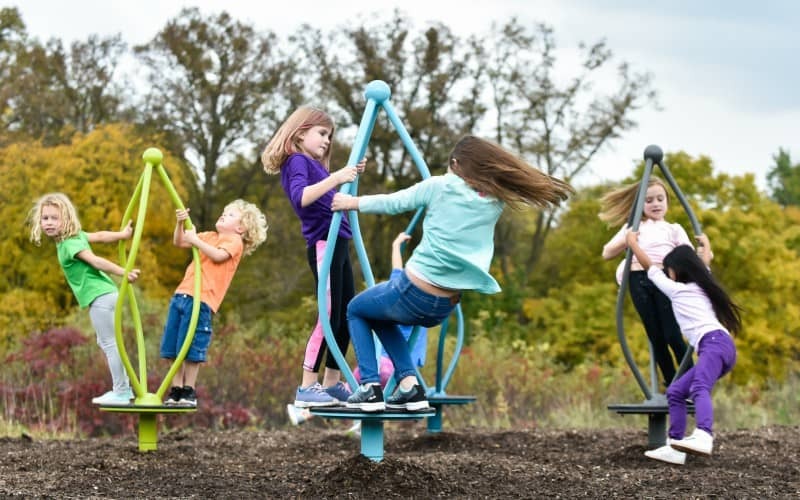 While a lot of municipalities and communities talk about the importance of fitness and the benefits of outdoor exercise, Park Superintendent Rick Holtzman and his team took action. 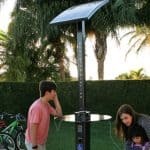 Rick worked with Steve Hemler of General Recreation to design a complete outdoor gym experience using Landscape Structures’ (LSI) HealthBeat® equipment. Thinking about your next project? General Recreation Inc is rated 4.8 out of 5 based on 28 reviews from around the Web. Every step of the way, Gen Rec’s been there to answer our questions. We can count on them to be honest, open and onsite. It’s a load off my mind to know they can handle everything. It was easy to work with Gen Rec. Design updates, cost requests and other information came to us easily. I’ve been very impressed with the personal service. From our very first meeting, Steve’s professional manner, understanding of our needs and working within our budget were an extremely positive experience. The quality of the equipment also keeps us returning for more!” “ Even with a limited budget, I think we got a great variety of equipment,” she says. 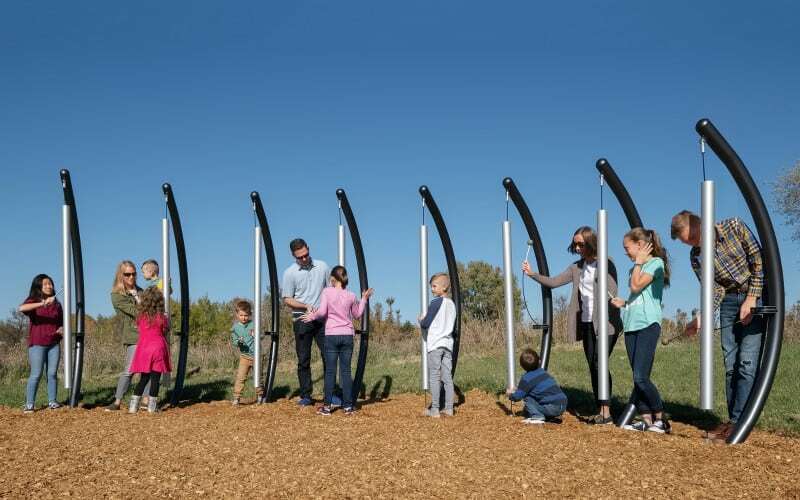 “ And, as for the results, the children LOVE the new playground! 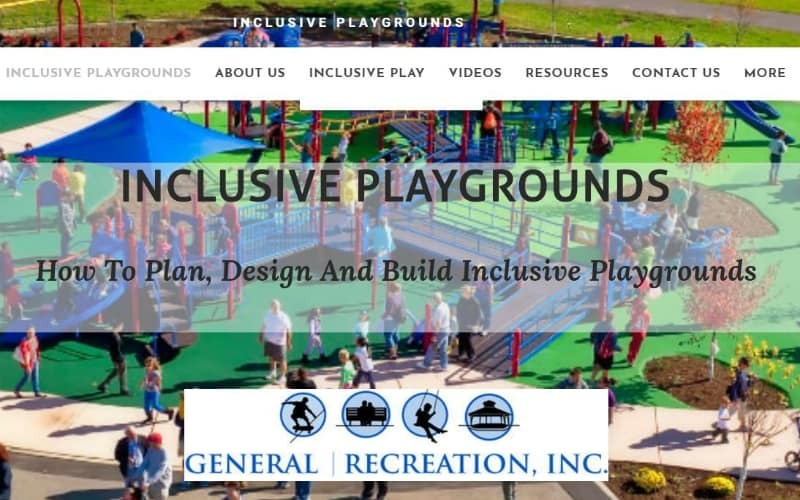 We chose Gen Rec for a variety of reasons, most importantly Steve [Hemler’s] passion for making our playground a reality; his willingness to go above and beyond to see the project through to completion; and his commitment to excellence and community."......... "Steve was and continues to be absolutely amazing and was a true pleasure to work with. I can guarantee any additional purchase will be made through Steve and he will be highly recommended for any opportunity that I have to share. (Steve was) very positive, energetic for the work---very courteous and attentive to our needs and interests in regards to project goals and overall impact for the program. Steve enabled us to visit other parks to see how they fit newer components into their parks. These visits were a selling point for us. We really appreciated the field testing and seeing how everything worked together. Michael [Wiley] listened to our vision. When we asked what we could do, both he and Landscape Structures fought for that vision.For two full weeks, both Andy [Cush] and Michael were always on-site to guide and help us. They were professional and fun— an awesome combination. I always enjoy working with Gen Rec. They helped to keep things moving smoothly and were very accommodating throughout a process that included several design changes. Steve Hemler is very thorough in all aspects and phases of the customer service process. He represents your company well and is one of the reasons for why we continue our business with you. First, we went on an adventure to visit a variety of playgrounds in the region. One that stood out to us was Gen Rec’s. 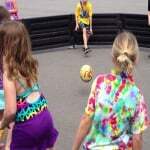 We wanted a top-notch, state-of-the-art playground with quality equipment and surfacing. We also were limited with space, so we needed to use it wisely. Curtis helped us accomplish all of that. We enjoyed working with Curtis. He suggested that we have our church community build the playground with his supervision. We really appreciated this idea. It fit in with how we do things. Joe had included all the playful and thoughtful design details that other designers didn’t. It really stood out to us and tied the playground into the natural surroundings. He gave us a complete picture of what it could be and brought all of our ideas together. Andy, Michael, and their team have excellent experience, knowledge, and most importantly, I appreciate their familiarity and flexibility in managing community build projects. We have a system and so do they – and together we were able to work together really well. Andy helped us decide to place [our playground] in an existing parking lot. It was flat so no steps or elevation change was needed to make it accessible. Andy knew what would and wouldn’t work in the design. He made everything run smoothly. We wanted to have a look and feel exclusive to the area—something that could only be Ohiopyle—like no other place in any other town. 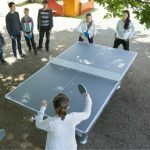 General Recreation’s equipment had the unique features we wanted. Steve Hemler is by far the best salesperson I have ever dealt with. He went way beyond his call of duty. Very good experience. [We] will most definitely be using Landscape Structures in the future, mainly because of Steve Hemler. Anyone thinking of such a project in their hometown are encouraged to come see our boundless field and playground of dreams. It’s definitely a grand-slam facility. The staff at General Recreation are some of the best 'Playground People' I have ever worked with. The Locust Street Playground community-build was better than we imagined! We had just shy of 300 community members come out on June 22, 2013. It was one of the biggest projects we've done. Michael, First off, thank you so much for everything! The playground looks fantastic and we are so happy! You displayed great patience and flexibility on this project and you made my job so much easier. Landscape Structures made the daunting task of organizing a community build fun and tangible. Joe did everything to make sure our playground was perfect. We were especially grateful to him for helping us get the signs translated into Spanish. Steve was able to take the vision in my head and make it real,recalls Rick. We’ve grown up in the parks and rec industry together, and Steve is the guy you can lean on. He wants you to learn and understand the process. You can rely on his team to come through with the product. Gen Rec’s support staff and customer service is unbelievable. The installation was easy and smooth, says Rick, who’s fortunate to have a talented, in-house install team. Steve trains our staff well, which helps us save money, allocating more funds toward equipment. We’re always able to build effectively under Gen Rec’s guidance. 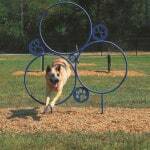 Their ability and knowledge of the playground and park world is just awesome. Sign Up for our email newsletter and stay connected to General Recreation.